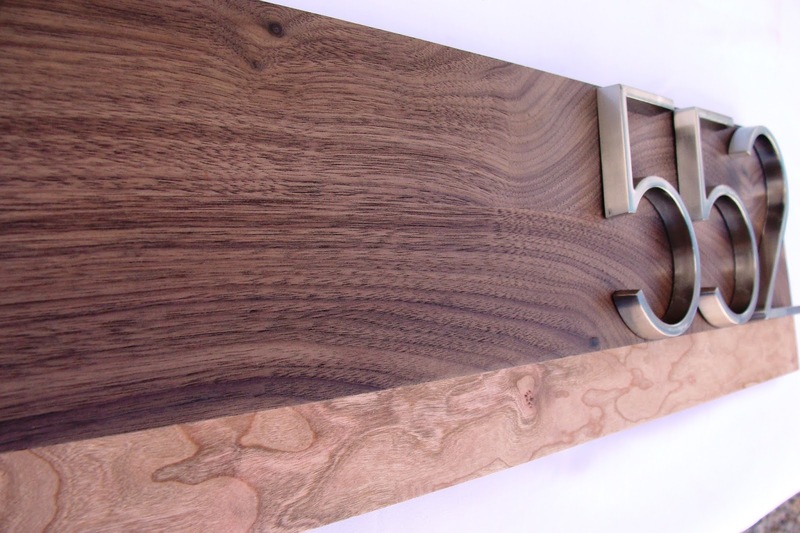 One of Good To The Grain's contemporary designs, an address plaque. I love seeing people grow. One of my readers, Diane Decocq, has made the jump to starting her own custom woodworking business, Good To The Grain. As part of expanding her business, she wants to expand her skills. To do this, she's planning to attend the Southwest School Of Woodworking, in Phoenix, AZ. She's started a Kickstarter project to fund her studies. This will cover materials and tuition. In return for pledged funds, she offers a variety of custom-made items. Go to her Kickstarter page to learn more or help fund her classes. It includes a video slideshow of some of her work. If you're unfamiliar with how Kickstarter works, you can get more information at their "about" page. But the short description is that it's a website to allow people to fund creative projects and receive items resulting from that funding. This is known as crowdfunding. By helping in small amounts, a crowd of people are able to pool their resources to help achieve something bigger. The Southwest School Of Woodworking looks like a great place. Good course selection, good list of instructors, good workspace. Good luck with your new venture, Diane! The work created by the Good to Great is beautiful! What a great opportunity to help someone and get decor for your home. The work she does is beautiful and you can tell her heart goes into every piece that she designs for someone.